Over the years snacks have developed a “bad image”, but they can actually be an important part of a meal, especially for a pregnant women. They provide you the needed energy and protein in the middle of the day which keeps you going on till dinner. You just need to avoid to reach out to the bag of chips or any other deep fried snack. Make your choice wisely and you are all set to gain in some nutrients than just the fat. Enjoy these snacks in the evening when you are at home. If you’re travelling or are at work, make some dry snack during the weekends so you are set for the week. Just ensure that size of the snack should be of the right size –a good balance between enough calories to satisfy you, but still not too many. However at times, if time doesn’t permit to cook any of these snacks, occasionally opt for fruits like apple, pear, strawberries, orange, guava or grapefruit as they have natural sugar, fiber and some amount of water content too. Remember fruits are always a healthier option than readymade fruit juices. So plan your snacks well ahead in time and get set for a healthy indulgence throughout your pregnancy. Oats Mutter Dosa is an instant dosa batter packed with protein and fibre. Oats must be consumed daily for its high content of soluble fibre ‘beta-glucan’, a potent blood sugar and cholesterol-lowering agent. The addition of urad dal and carrots make the dosas rich in protein and vitamin A too. Prepare this instantly and serve it hot with a chutney of your choice. Multiflour Idli is easy-to-make idli and has a fabulous, rustic flavour and interesting texture that you will enjoy thoroughly at any time during gestation. A batter of soaked and ground urad dal combined with wholesome flours like bajra, nachni, etc., gives us perfect idlis that replenish your calcium stores and give you good quality protein as well. Mini Jowar Apple and Walnut Pancakes are iron-laden pancakes and are a smart and healthy way to satisfy your sweet tooth during pregnancy. Jowar, walnuts, almonds and jaggery are all rich in iron, while unpeeled apples give you a dose of fibre and other nutrients too. Oats Methi Multiflour Khakhra are crisp, tasty are and full of iron-rich ingredients like fenugreek, jowar and nachni, which not only contribute iron to the recipe, but also improve the flavour and texture of the khakhra remarkably. Oats brings to the table loads of fibre, which helps to keep your digestive tract healthy. Here is a healthy version of puri that you can binge on without any guilt. Made using fibre-rich oats, Baked Oats Puri is flavoured with sesame seeds, garlic paste and kasuri methi too. Healthy Methi Crispies are some recipe ideas to turn to then. So, whenever you find time, make a batch of these scrumptious dry snacks and stock them in an airtight container. Ragi and Oat Crackers are all the better, as they are made with wholesome ragi, oats and whole wheat flour, perked up with olive oil and other seasonings. 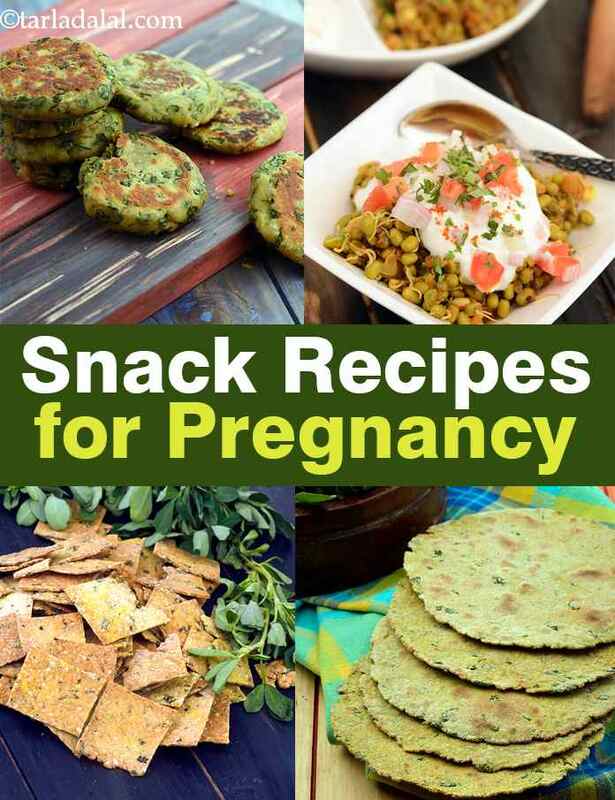 Enjoy all our snack recipes for pregnancy. Explore more varieties in our pregnancy section everyday.